Call (800) 375-9006 to speak to a representative now! 6th Annual APMEX & Perth Mint Australian Giveaway Winner Announced! In August 2014, APMEX and the Perth Mint launched their 6th Annual Perth Mint Australian Giveaway. Recently, the winner was chosen and we’re excited to congratulate Mark S. from Texas on his selection as the winner! The contest ran through October 20 and more than 2,600 people entered, either through mail-in entry or by purchasing select Gold and Silver Perth Mint products. Since 2008, APMEX and the Perth Mint have partnered to bring customers this once-in-a-lifetime experience. With entries growing yearly, it’s become an event that people anticipate and are excited to enter. Oftentimes, winners will chronicle their journey through photos or even a personal blog. Mark and his wife are excited to take their trip next summer, which happens to coincide with their 25th wedding anniversary. As part of his winnings, Mark will receive $1,000 (AUD) spending money, an exclusive VIP tour of the Perth Mint, roundtrip airfare, hotel accommodations for 7 days and memories to last a lifetime. The Perth Mint is renowned for producing some of the most beautiful Precious Metals products in the world. If you haven’t seen our lineup of Gold and Silver from the Perth Mint, then you don’t know what you’re missing. View our products from the land down under: Gold Kangaroos, Silver Kookaburras, Silver Koalas, Gold Lunar and Silver Lunar. We had the opportunity to chat with Natasha Muhl, the creative force behind the APMEXclusive 2014 1/2 oz Silver Australian Great White Shark. See below for some unique insights into her design process. I’m from the Kimberley in the North West of Western Australia, so I spent a lot of time outdoors in nature growing up. This would probably be my biggest inspiration, especially when it comes to designing Australian fauna-themed coins. While doing my research for any new series, I tend to look at a range of photography and watch nature documentaries. This helps me to accurately recreate the animal. I also take inspiration from coin collecting catalogs and numismatic magazines, as it’s always great to see what other mints are up to and keep ideas fresh. How do you start the design process? The Perth Mint Sales and Marketing team meet fortnightly to discuss potential concepts for each coin program. Once the theme has been determined, the designers are given a detailed creative brief to follow. As part of the research process we often take part in field trips. With the Great White Shark bullion coin for example, I visited the Aquarium of Western Australia and dived with a range of sharks. It was wonderful to come face to face with these amazing creatures and it really helped steer my creative process. What are some of your favorite coins? There are so many to choose from, but I would have to say The Perth Mint’s Famous Ballets Silver proof coin set, with its subtle pad printing details, is one of my favorites. More recently I’m really enjoying the Gods of Olympus series which is struck in high relief to a rimless format – a first for the Mint! These mythological gods are quite dark and moody so it is an exciting concept for the design studio. They have also proven to be extremely popular with collectors which is always great. How did you get into designing coins? I studied at Central Institute of Technology [in Perth], graduating with an Advanced Diploma in Graphic Design in 2009. Fellow Perth Mint designer, Tom Vaughan, was a previous classmate of mine and he kindly recommended me to the Mint when they were looking for a new illustrator. It’s always been my dream to become a designer, so I feel very fortunate to work for The Perth Mint as I get the chance to illustrate a broad range of themes for a variety of audiences. Why a shark instead of another sea predator or animal? The Great White Shark is probably the most feared and interesting predator in existence. Most people around the world have watched the movie Jaws and can imagine the terror of an encounter with this deadly creature. I think that’s what makes them so exciting and sought-after. 6 fun facts about one of the world’s most innovative mints: The Perth Mint of Australia. If you’re an APMEX customer, you may know The Perth Mint as the prized destination for our annual “Escape To Australia” contest. As an investor or collector, you probably know The Perth Mint for their products. Their Gold and Silver Lunar coins are among the most beautiful and collected Chinese Zodiac coins in the world. Here are a few surprising facts about The Perth Mint that you might not know. Rare. Many Perth Mint coins are made in strictly limited mintages, giving even their most value-priced bullion coins a dimension of collectibility. Same Location since 1899. 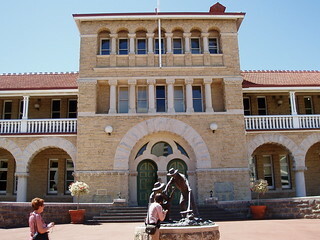 The Perth Mint was established in 1899 as a branch of Britain’s Royal Mint. Today, it’s one of the oldest mints in the world to operate on its original premises, despite the name change.. The Perth Mint is actually incorporated as Gold Corporation and has two wholly owned subsidiaries – Western Australian Mint and GoldCorp USA. Created The First Gold Bullion Series. In 1986, The Perth Mint launched the Australian Gold Nugget Coin Series, the first bullion series with a reverse (back) design that changes every year. The first few coins featured Gold nuggets. In 1989, the design switched to a kangaroo. Today, we commonly call this series the Australian Gold Kangaroo. Biggest and Best. In 2011, The Perth Mint unveiled the biggest, heaviest and inherently most valuable Gold coin in the world. Weighing in at 1,000kg (2,204.6 pounds), this coin contains one metric tonne of 99.99 percent pure Gold and is worth more than $42.6 million at current Gold prices. A Refinery and A Mint. There’s only one Gold refinery in Australia and it’s The Perth Mint. Between coins, bullion and industrial Gold, The Perth Mint produces more than 400 tonnes of Gold per year. WIN A FREE TRIP TO PERTH AND THE PERTH MINT! Every fall, when the new Perth Mint coins come out, APMEX launches the “Escape To Australia” contest. Watch for it on this blog and APMEX.com. Tell us a little bit about the history of the Perth Mint. The Perth Mint was established in 1899 as a branch of Britain’s Royal Mint to refine the gold from Western Australia’s eastern goldfields, and to turn it into sovereigns and half sovereigns for use throughout the Empire. The Mint continued under British control until 1970, when ownership was transferred to the Government of Western Australia. In the mid-1980s, following a major redevelopment initiated by the State Government, The Perth Mint became the home of the Australian Precious Metals Coin Program. By agreement with the Commonwealth Government, the Mint manufactures and markets an extensive range of legal tender gold, silver and platinum coins to investors and collectors worldwide. Operated by Gold Corporation, The Perth Mint is committed to adding value to, and creating demand, for Australian precious metals in a worldwide market. In addition to producing the world’s widest range of precious metal minted products, The Perth Mint operates Australia’s only precious metals refinery. It also offers a variety of investment options and storage facilities, and hosts a multi-award winning attraction which welcomes more than 80,000 visitors each year. Can you please tell us more about the design for the Lunar Horse? The Perth Mint has a dedicated team of six talented designers who together work with sculptors, engravers and engineers to create the intricate designs of our Australian Lunar Coin Program. In 2014, the reverse designs of the gold coins depict a horse galloping in a stylised scene of mountains and clouds, which represents the highland regions of China. The horse symbolises freedom and reinforces the energetic characteristics of this spirited animal. The design featured on the reverse of the silver coins depicts two horses standing in a Chinese landscape inspired by traditional Chinese painting styles. The two animals standing together represent the creature’s social nature and companionship. What makes the Lunar Series special and collectable? The Australian Lunar Series II is the most sought-after annual coin program released by The Perth Mint, with a number of the more popular issues selling out soon after they are released. This result is due to the consistent high quality of our bullion coins, coupled with annual design changes and select mintages, which combine to create potential for numismatic appreciation above each coin’s investment value. In 2015, we will unveil exciting new designs in celebration of the Year of the Goat. Here at the Mint, we work for more than one year in advance to perfect our Lunar design, and I can tell you that our designers are currently finalising a range of options for both the gold and silver issues. The Lunar goat is renowned for peace, health and success; as such, our 2015 coins will reflect these attributes in our designs. What can the winner look forward to during their trip to Perth? A visit to The Perth Mint! As one of Western Australia’s leading tourist attractions, The Perth Mint offers a combination of unique exhibitions and demonstrations themed on gold. Other popular Perth attractions include unspoilt white beaches, Kings Park, the Bell Tower, Perth Zoo, and Caversham Wildlife Park where visitors can see kangaroos, koalas, kookaburras and wombats. Shop the 2014 Perth Mint collection for your chance to win! *Purchase not necessary to enter. Click Here for complete rules. Colorized Perth Mint Lunar Gold – Buy beautiful Australian Gold in full color. Designed by the Perth Mint in Australia, these colorized Australian Gold Lunar coins are among some of the most beautiful coins in the world. APMEX has limited quantities of these highly collectible colorized Gold coins, and special pricing is available for a limited time only. Struck from .9999 fine Gold, Australian Gold Lunar Series II coins are a great way to acquire and invest in Precious Metals. Inspired by China’s ancient lunar calendar, the Australian Gold Lunar Series coins feature the 12 animals central to the calendar’s stories in striking colorization. According to the lunar calendar, each of these 12 animals has a profound influence over those born under its year of “rule.” The Australian Gold Lunar Series II began in 2008 with the Year of the Mouse coins and will end with the Year of the Pig coins in 2019. Buy colorized Australian Gold Lunar Series II coins that appeal to collectors and investors all over the world. Add these Australian Gold items produced by the Perth Mint to your Gold coin collection or Gold investment portfolio. APMEX makes it easy to buy Gold by offering competitive Gold prices on all Gold coins. Don’t miss out on this great opportunity- Click here to Buy Now. In 2007, the Perth Mint of Australia began minting a beautiful bullion coin: the Silver Koala. These Silver coins celebrate the iconic marsupial of Australia. Due to the variety of designs on the Silver Koala coins, they have become one of the country’s favorite collectibles and are gaining popularity around the world! Each 1 oz Silver Australian Koala is struck in .999 fine Silver. The obverse of this Silver coin features the Ian Rank-Broadley designed likeness of Her Majesty Queen Elizabeth II and lists the face value of the coin, $1. The 2013 issue depicts an adult koala sitting in the fork of a eucalyptus tree. Each year, the Silver Koala coins feature a different design, which makes them very attractive to collectors. Also, since this is just the seventh year of mintage for the Silver Koalas, you would not have to buy many backdated coins in order to have a complete collection. The Perth Mint was founded in 1899 as a branch of Britain’s Royal Mint to help supply the Gold sovereigns and half sovereigns, which were used as everyday circulating coins throughout the British Empire. In 1970, control of the mint passed from Britain to the Western Australian Government, which still owns it to this day. Don’t miss your chance to own these beautiful collector’s items. Get your 2013 1 oz Silver Australian Koala coins from APMEX today! The Ultimate Canadian Getaway is Back!